Torex Gold has reported a positive preliminary economic assessment (PEA) for development of an underground mine on the Media Luna deposit of its Morelos property in Guerrero state, Mexico. Torex currently is commissioning its El Limón-Guajes open-pit mine on the property, with the first gold pour expected before year-end 2015. The Media Luna deposit is located 6.7 km south of and across the Balsas River from El Limón-Guajes. The El Limón-Guajes process plant has a designed throughput rate of 14,000 mt/d. 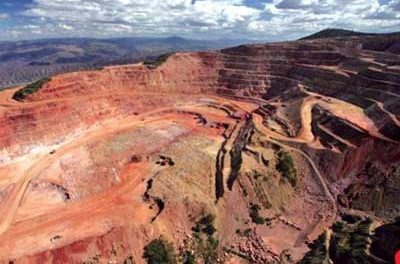 Planning for Media Luna assumes a mining rate of 7,000 mt/d, which, once in production, would be fed to the El Limón-Guajes plant, while 7,000 mt/d of lower-grade El Limón-Guajes ore would be stockpiled for later processing. Media Luna mine life is estimated at 13 years, with 2021 as the potential first year of full production. Gold-silver-copper mineralization at Media Luna is primarily associated with sulphidized pyroxene-garnet-magnetite exoskarn, with zones of massive magnetite-sulphide. The PEA is based on an estimated inferred mineral resource of 51.5 million mt grading 4.48 gold equivalent oz/mt and containing 7.42 million gold equivalent oz. Contained metal is estimated at 3.98 million oz of gold, 44.02 million oz of silver, and 1.13 billion lb of copper. Average annual metal production from the Media Luna resource is estimated at 170,000 oz/y gold, 1.7 million oz/y silver, and 46.4 million lb/y copper, at an average all-in sustaining cost of $636/gold equivalent oz. Capital expenditure to develop the project is estimated at $481.8 million. Mining at Media Luna is planned to be split two-thirds long-hole open stoping and one-third cut and fill. Ore transfer to the El Limón-Guajes mill would be via a suspended rope conveyor belt that would originate in the Media Luna mining area, proceed through a tunnel to an exit south of the Balsas river, be suspended above the river until it reaches El Limon ridge, and enter a tunnel through El Limon ridge that would exit in close proximity to the El Limón-Guajes mill. A flotation circuit would be added to the plant to process Media Luna ore. The conveyor would carry filtered tails back to the mining area on the return side of the belt. The conceptual design considers the use of existing roads, power, administration, housing, security, and infrastructure north of the river to minimize the environmental impact south of the river. Torex President and CEO Fred Stanford said, “Our strategy has always been to get the El Limon-Guajes resource up to 5 million oz and build the mine, find a second mine on the same property, and build that one as well. Progress toward completion of the construction of the El Limón Guajes mine continues to be excellent, and this PEA for Media Luna illustrates the potential viability of its resources on the same property both on a commercial and social basis.